Globe mallow (Sphaeralcea ambigua) brings a unique “cottage-garden” feel to the desert plant palette along with some surprises. In spring a flush of beautiful flowers are produced that will cause people to stop in their tracks. After that, globe mallow will bloom off and on throughout the summer and fall. This shrubby, perennial is native to the Southwestern areas of North America where it is found growing along washes and rocky slopes. They grow quickly and reach approximately 3 ft. X 3 ft. in size. Globe mallow is cold hardy to about 20 degrees F.
Although most globe mallow plants produce orange flowers, they are available in other colors including pink, purple, white, red and shades in between. At the nursery, you will usually see the orange flowered variety available. However, some growers are beginning to stock selections of globe mallow in different colors. But buyer beware; unless specially marked or blooming, you don’t know exactly what color flower you will end up with make sure if you want a certain color to check for mark. Often, the surprise occurs after you plant them and wait to see what color the flowers will be. I bought four globe mallow, out of bloom, for my garden and ended up with one red, two pink and one white. For those who do not like surprises in the garden, you can wait and buy them in bloom in the spring. USES: Globe mallow attracts hummingbirds as well as butterflies. They serve as a colorful backdrop for small perennials or small cacti. Consider planting with any of the following plants for a colorful desert flower garden – penstemon, desert marigold, ruellia, and blackfoot daisy. This beautiful but tough plant does best in full sun and performs well in areas with hot, reflected heat. Do not plant in shady areas as this will cause them to grow leggy. Globe mallow do self-seed, and the seedlings can be moved and transplanted in the fall if desired. They are used frequently for re-vegetation purposes because they grow readily from seed. MAINTENANCE: This pretty perennial is very low-maintenance. No fertilizer or amendments to the soil are required. Prune once a year to approximately 6 inches to 1 ft. after it has finished blooming in late spring/early summer, which will help to prevent them from self-seeding, maximize future blooming and minimize unproductive, woody growth. Globe mallow is not the type of plant to repeatedly shear into a formal shape. When pruning, wear gloves and long sleeves since the tiny hairs on the leaves can be irritating to some as well as an eye irritant. Once established, globe mallow is quite drought-tolerant, but will require supplemental irrigation for the best appearance and flowering. My globe mallow plants are connected to my drip-irrigation system and do very well when watered three to four times a month, spring through fall. ADDITIONAL FACTS: Historically, globe mallow were used by Native Americans for medicinal purposes such as treating diarrhea, sore throats, eye diseases as well as skin disorders. Their roots were used for upset stomachs and poultices were made for treating swollen joints and broken bones. *Have you ever grown globe mallow? If my garden were larger, I would try rose mallow. Yours look so good. The blooms are lovely. I think these bushes are lovely. It comes in a variety of colours too. That's great! lovely blooms. we grow red one here. but you have shared with us some lovely colors. Hi! Hey you have a great blog! But man, gardening in the DESERT! Wow. You prove that it can be done, that's for sure! I love these, I wish they were hardier! I need something -25. Thanks for the tips on this plant. I have been learning about medicinal uses of natives and this was very informative. So many plants to see and compare between your garden and my humid one. In a quick look, I see Tecoma stans, Red Bird of Paradise that we both grow — mine are killed to the ground in winter but return. A nursery near here has Parkinsonia and I aspire to that, maybe next year. The local McDonald's had a huge tree but it died after their fire. I look forward to see what seeds you're sowing this fall. Superb! I can't get over the purply and the white one. Thanks for the pruning tips too. I often don't know what to do with mine. Will definitely cut out that older wood now. My un-irrigated globemallows look a little tattered in late summer. Maybe, I'll give them a mid-summer soaking this year. I am very excited to see so many other colors! 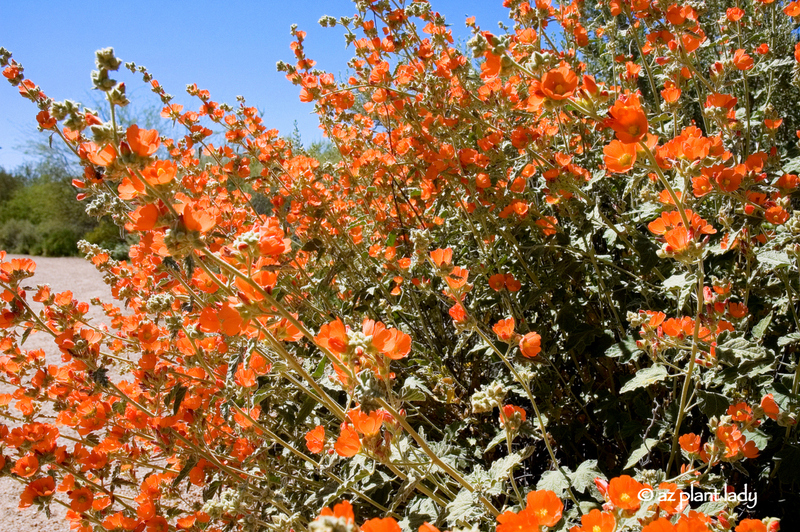 Desert Mallow grows wild here, but only in the orange color. I am going to find the other colors and start growing them in my garden! Thanks! Thank you so much for all the info on Globe Mallow! I've been looking for deadheading instructions, and you've given me just what I needed. I'm going to wait until the bloom is completely finished (getting close in early June in Colorado) and then cut back to 6 in-1 foot. Many thanks!! Hi! How often do they get water on the drip system? I'm scared I'm overwateing them, the leaves are starting to get yellow from the bottom up. How often do they get watered on the drip system? I'm afraid mine might be getting too much water. They are starting to yellow from the bottom up. It does sound like your Globe Mallow are getting too much water. Ideally, they should get watered once every 3 weeks in winter. In spring and fall, water every other week and in summer, water once a week. Will the plant with yellow leaves come back once one reduces the water? I have several seedlings in pots that a friend gave me, and I have been waiting to plant them till it is slightly cooler, but they have definitely been getting over watered. Whether or not it recovers, depends on how wet the soil is and how long they have been overwatered. I would plant them in October if possible. Thanks to your ideas, we have a beautiful area with globemallows, Queen’s wreath, blackfoot daisies, and angelitas all surrounding a fountain. One issue is that our globemallows are growing so fast that they are almost too big. They are more like 4’x4′ than 3’x3′ so they are crowding the daisies and falling to the ground under their own weight. Do you suggest we prune them or wait until later and let nature do its thing? I would suspect that they are getting too much water, which is making them ‘floppy’. This may be due to the water feature. You could go ahead prune them back severely, which keeps them attractive. Do whenever they become straggly. Great, we will prune them this weekend. That should let the shorter flowers thrive a little more, too. Also, I’ll keep the water to a minimum. Now, that everything around it is established, they should not be getting much water. You are very welcome, Dave! I’m sorry to hear that you are having problems with your globe mallow. They do need full sun – at least 6+ hours a day. Once they are finished flowering, prune them back severely to 6 – `12 inches tall and wide to rejuvenate. They will grow back. Globe mallow also don’t need much water, once they are established – about once every 7-10 days in summer to every 2 weeks in spring and fall. Monthly watering in winter should be sufficient. Water so that it penetrates 1 foot deep into the soil. Too much water can kill them. I hope this helps! I love mallows. Our peachy orange native one is my fav and I didn’t know they came in the other colors. I have tried for years to get them to grow on our property as they grow wild very close to us. I bring home seeds I gather on walks and spread them around. This year I was so happy to have 2 come up. The got about a foot tall and now have vanished. My husband thinks rabbits ate them but I don’t know. I mean the rabbits don’t eat the ones lining the roads! Lovely photos of yours and gives me hope I can get some to grow here too. Rabbits tend to eat young plants. So if you have any new globe mallow come up, I recommend surrounding them with a temporary chicken wire cage for the first year. After that, the rabbits should leave them alone. I am going to try starting them from seed and growing in my dry backyard in Pennsylvania. any tips on seed starting? To be honest, the less you do to prepare them, the better. They seem to grow best when they self-seed than when they are planted from seed by hand. So, my advice is to do very little than water them every week or so in the absence of rain until they germinate. I’ve got two in containers not doing well, getting yellow leaves at the base. I only water when dry, but maybe I’m watering too deeply or too often? I’ve never seen them in pots but I thought I’d give it a shot because I’m a renter. They get full sun all day, until about 4. What am I doing wrong? It’s hard to know exactly what is wrong with them. I suspect, from your description, that it is getting too much water. I would add another day or two in between waterings. We just landscaped our south facing lawn in March and have three Globe Mallow, one in orange and two in red. They are quite lovely. They receive watering twice a day but I am concerned that they might be getting too much water at this point. No yellowing leaves at this point but how long does it take for dessert shrubs to get established before we cut back to once a week watering during the summer. We have a drip system, which I believe runs for about 10 minutes twice daily. I was set up by our landscaper. Your drip system is watering your plants too often and not deeply enough. Drought tolerant plants such as globe mallow, do best with deep, infrequent watering. Here is a helpful link for watering guidelines for people who live in the low desert region of Phoenix, which should help. *Gradually wean your plants to the new schedule, which can take up to 3 months, by gradually extending the period of time in between watering. Pay special attention to the watering chart on page 12 of “Landscape Watering By the Numbers”, which states that an average drip system takes approximately 2 hours to water to the appropriate depth. I hope this helps! I have several orange globe mallow in my yard. I never planted them. They are volunteers that have been growing for years, even coming back after a landscaper I hired pulled them out thinking they were weeds. I rarely give them supplemental water and cut them back in the hot months. They just get more beautiful each year. I love them and would like to find the pink ones. Nurse Plants and Cactus Ready, Set, Go! Time to Start Planting!